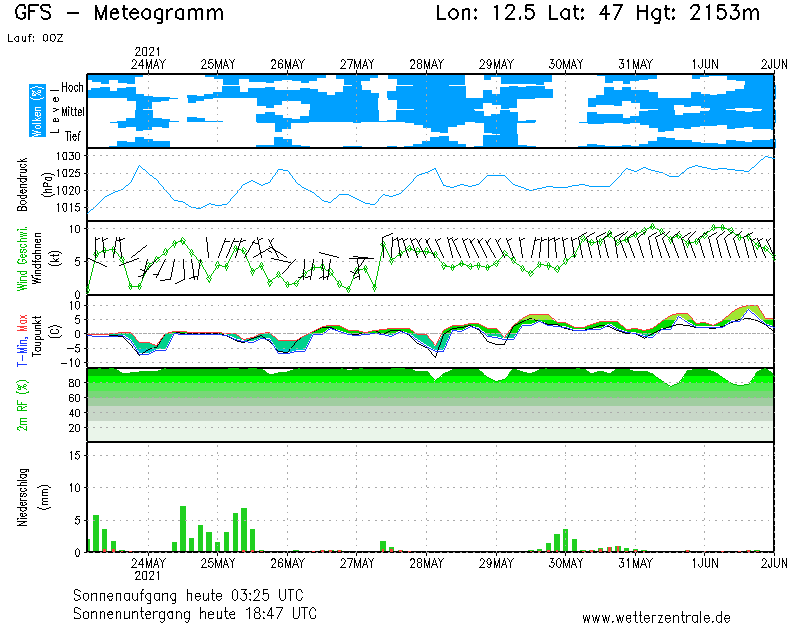 Beginners guide to forecasting, GFS models? 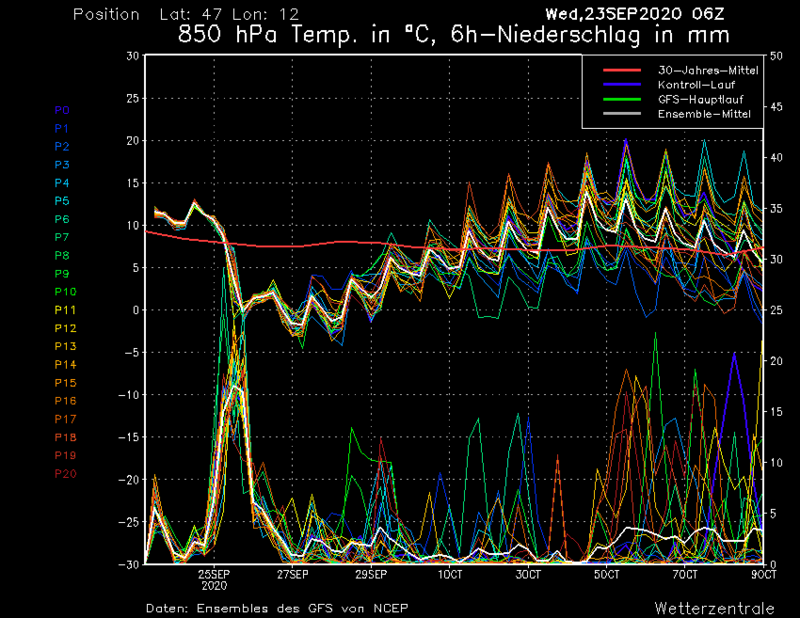 Seems there are some experienced weather peeps on here who understand the various models, so could anybody share some basic steps, ie where to go for some easy to understand graphs like the ones Brian occasionally posts, and how to interpret them? 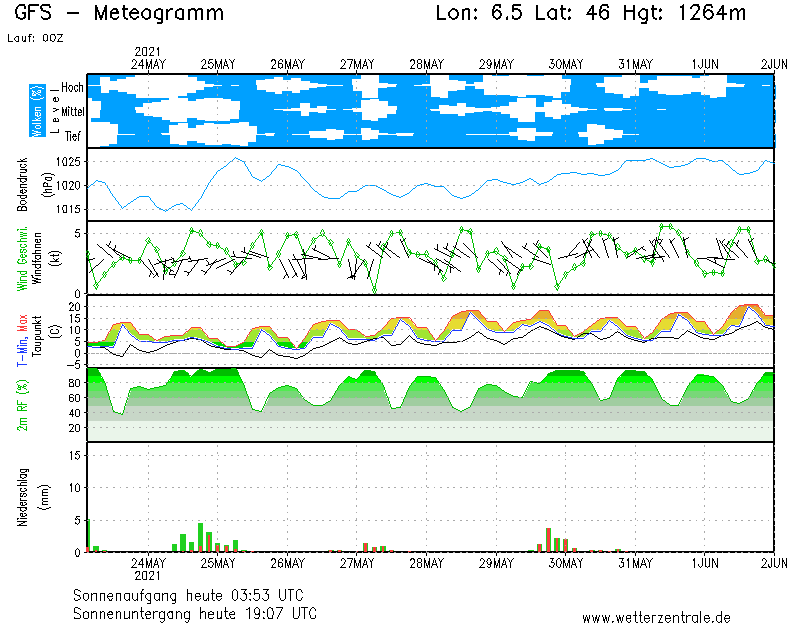 GFS data from the current run can be found here by including the relevant coordinates (eg Tignes is 45.49 lat, 6.92 long), selecting the GFS 0-180hr metogram, then typing in the password shown on the page. Key info this gives is precipitation and 850mb temperature (ie, temp at approximately 1500-1600m). 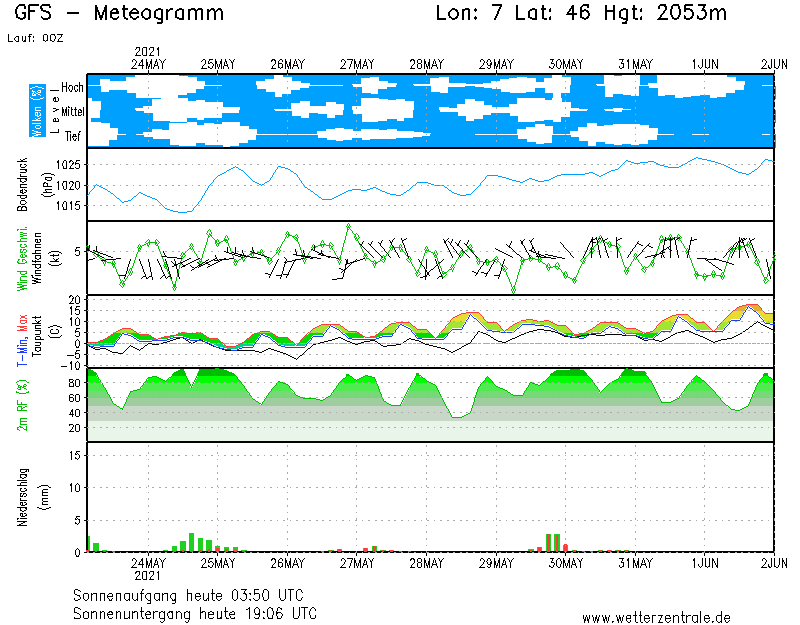 Data for succesive GFS forecasts can be found here. Select "Diagramme" in the lefthand menu, then select "Europa" in the middle menu, then select "Genf" (Geneva in German) and "Ensemble t850 und NDS" from the drop-down menus. This gives the same information as above (precipitation and 850mb temperature) for Geneva, but includes the last dozen GFS forecasts and an annual average. The average data is shown by the red line, the current forecast by the blue line, and the average of the last dozen forecasts by the white line. When all the different forecasts are in close alignment you can infer that there is some certainty in the GFS forecast data, but if the lines are all over the place it is difficult to say with any confidence what the weather will do. 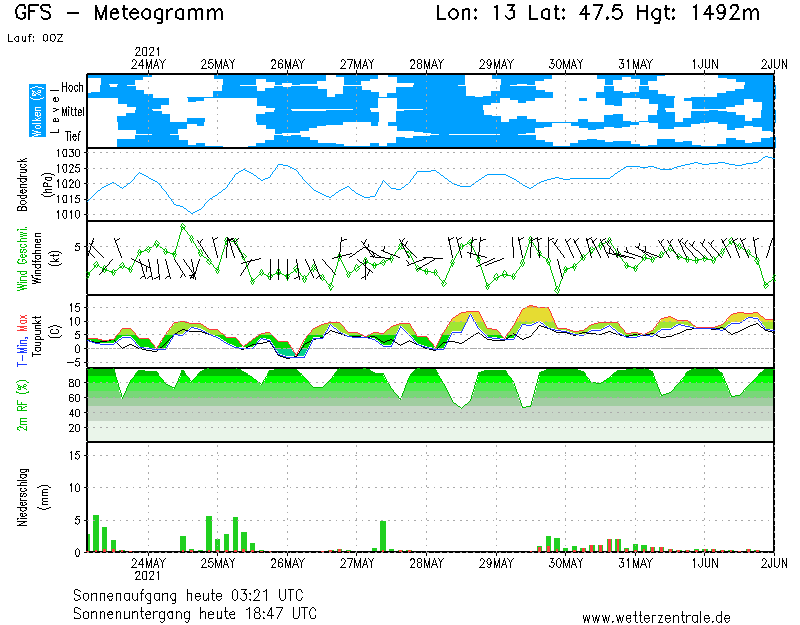 This chart from Meteo France is a good summary of this season's snow depths at La Plagne. This link is a precipitation radar covering most of Switzerland and some French and Italian resorts. 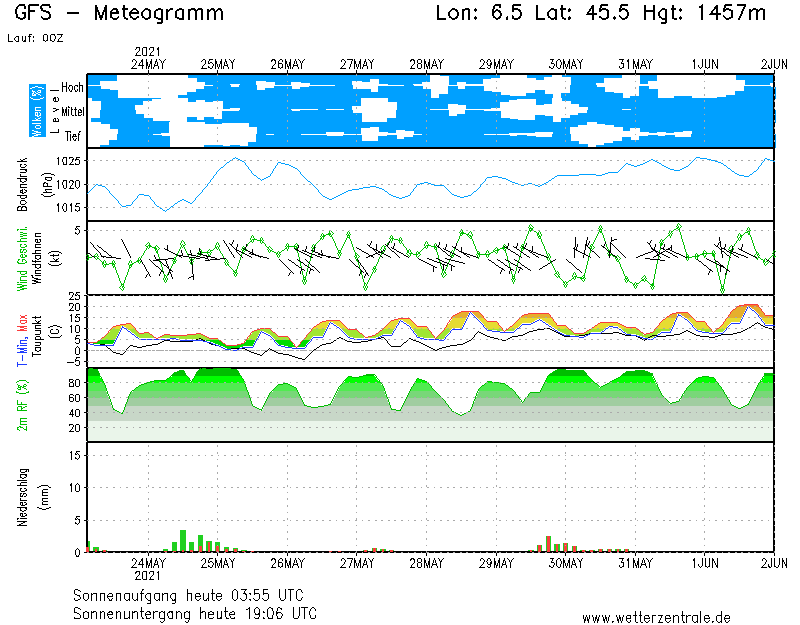 No use for forecasting, but fun for nowcasting! 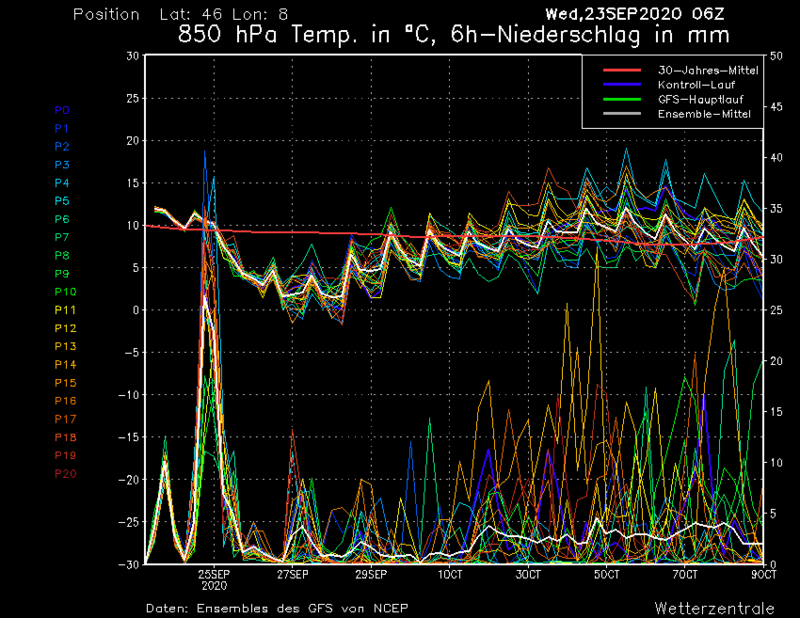 This site gives forecasts for Switzerland, but I think is based mostly on GFS data. This site does the same, but covers Europe without a focus on a particulr country. 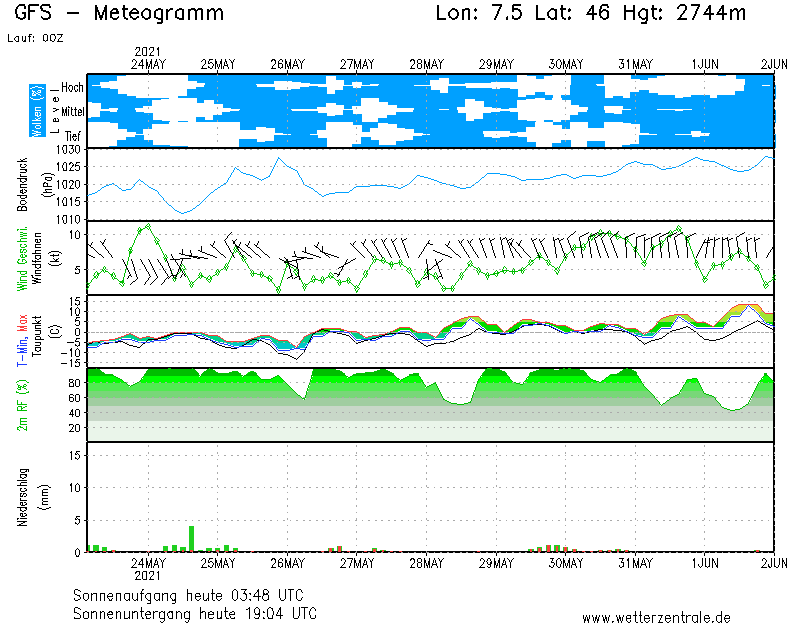 Chamonix Meteo seems to be an actual "weatherman" rather than a simple mathematical model from the GFS data. I'm sure other people who know what they're talking about will be able to add more useful sites. Good start Rob. 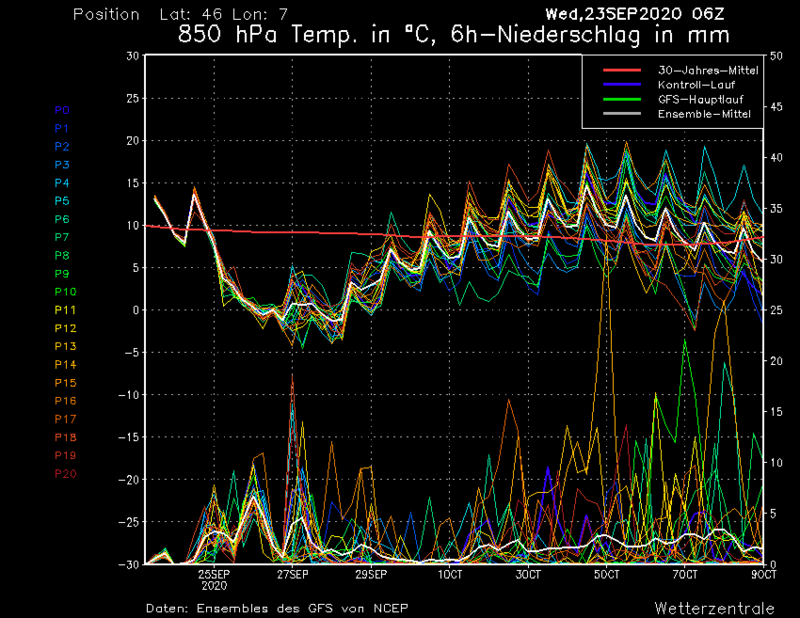 I'm also no expert - but you can discern a lot from the 850mb charts at www.wetterzentrale.de. Click on "GFS ENS 12Z" at the top (ish) of the page, then on "GFS" in top left box, then on the "850 hpa temperatur" link and use the links to scroll forwards in time. As Rob says, the data used to produce the coloured charts comes from the thick green line on the ensembles run he described. A bit more info on the ensembles - Rob wasn't entirely accurate about the runs being the last dozen or so forecasts - it's not quite like that. 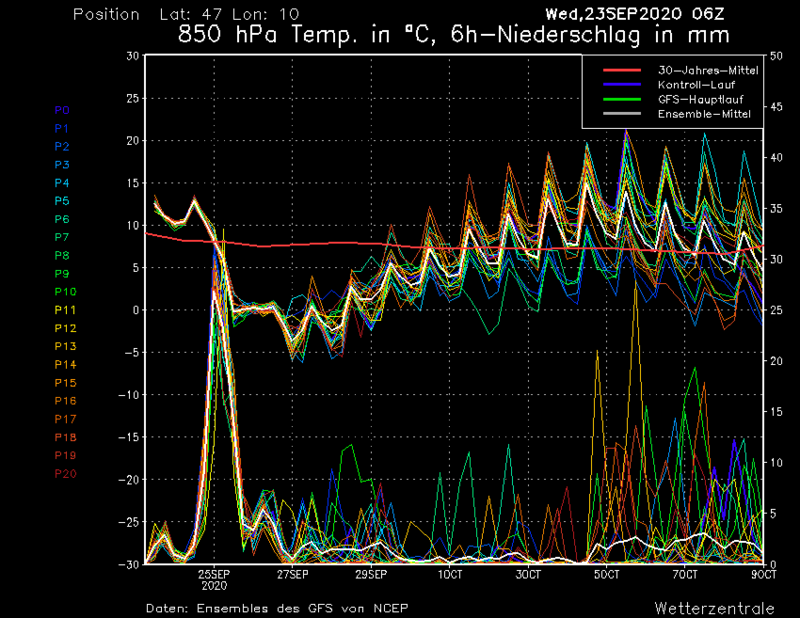 All the major numerical models (GFS, ECMWF, UKMO etc) run more than once each time they are issued. The reason for this is that although they each get fed a lot of data into them for each run, the data can never be considered perfect. To counteract this the model is run again with slight changes to the original data. Using the GFS as an example, the model is run 10 more times, 5 times with the data positively changed and 5 times with the data negatively changed. By following the ensembles you can get an idea of the likelihood of the forecast given by the main (control) run of the model being correct - if a large number of the ensemble runs are very similar to it, it is a good indication that confidence is reasonably high of the outcome. If very few of the ensemble runs show that outcome, then it is quite probable that it may well change. 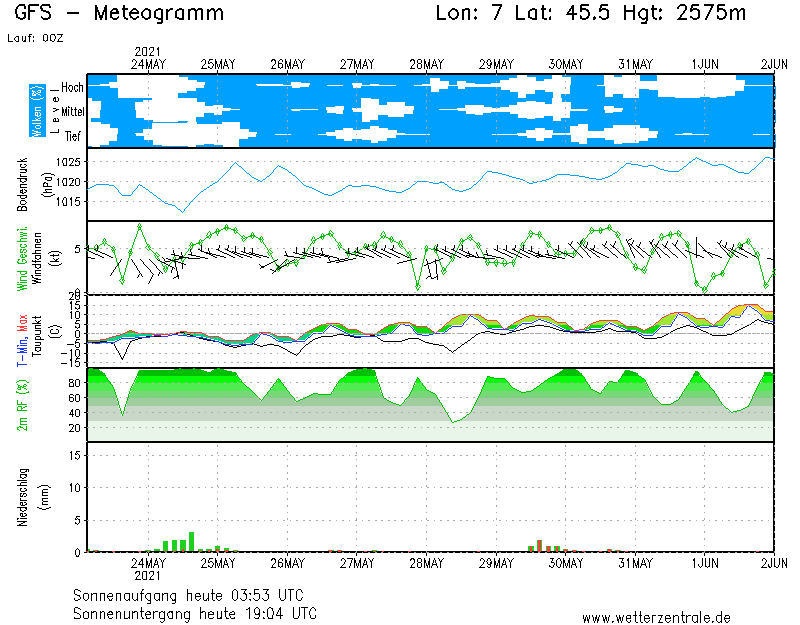 Basically you want to see low temps in conjunction with precipitation in order to achieve the best snow possibilities! just hope the forecast rise in temp doesn't happen the next week!! oh, and how do you get to that chart?? 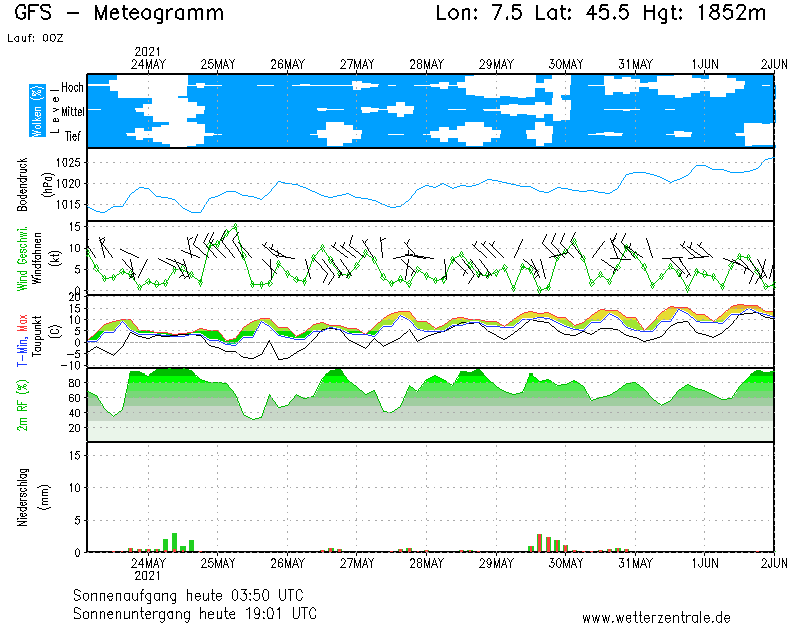 I followed your links above to http://www.wetterzentrale.de. but I get a map of Europe with temperature colours on it by following your instructions. gregh, follow Rob's instruction starting from "Data for succesive GFS forecasts can be found..."
To be honest Greg, it's not too bad. The lines are well scattered meaning there's little agreement at present, but there's a fair spread under the line. I'd settle for heavy snowfall in the next few days then gradually warming temps from when I arrive on Sunday! Especially bearing in mind we're fast approaching mid-April! How quickly does the 6hr update appear, ie I guess they did a run at 6am, but the graph still shows the 00 run???? Doh, thanks, missed that one!!! The 06z run shows a colder forecast for the first half of next week than the 00z run; hope this trend continues! brian, right first time... definitely a man... "carled" is just a concatenation of first name and surname with "Carl" being the first part! Surely they don't randomly choose which run becomes the control run, do they? carled, no, my understanding is what you said above, ie. that the control run is the input data unchanged and then the other ensemble runs have the data varied to reflect its known accuracy. However, I have noticed that from time to time the operational will be a marked outlier and then sometimes the others will follow it on subsequent runs. Sometimes not though. 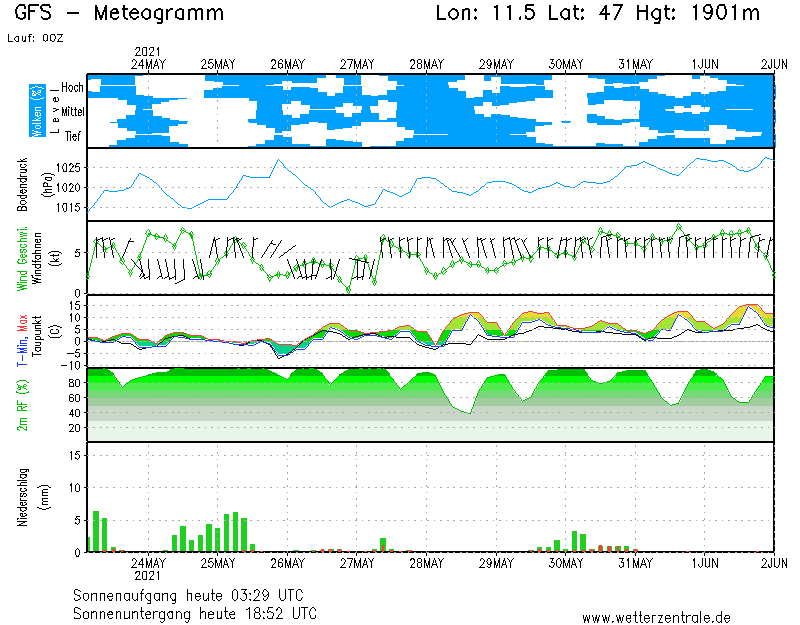 If the current forecast is blue, it shows a steady rise in temps until 14th April, then a nice drop off until the chart runs out. There is a huge disagreement in the models here, with one run showing -5 whilst the blue shows +11 and everything inbetween! Do I read this as saying "the forecast really has no clue at this particular moment in time?" 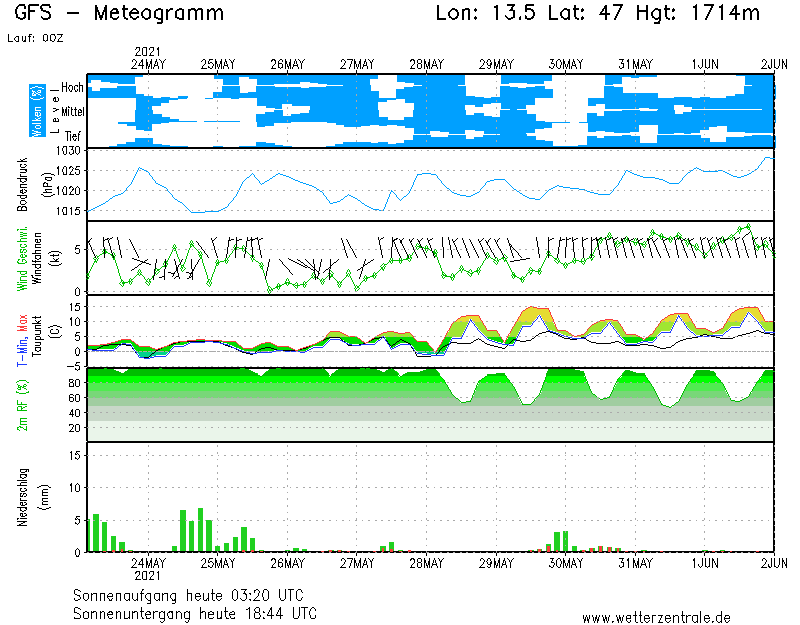 Similiar question for the snow in the bottom of the graph, there appear occasional peaks ie 10th, 13th, 15th, 19th and 21st. Most are only one or two lines, can I read anything into this, ie "some" precipitation is likely but the forecasts aren't sure when and how much? "some" precipitation is likely but the forecasts aren't sure when and how much? 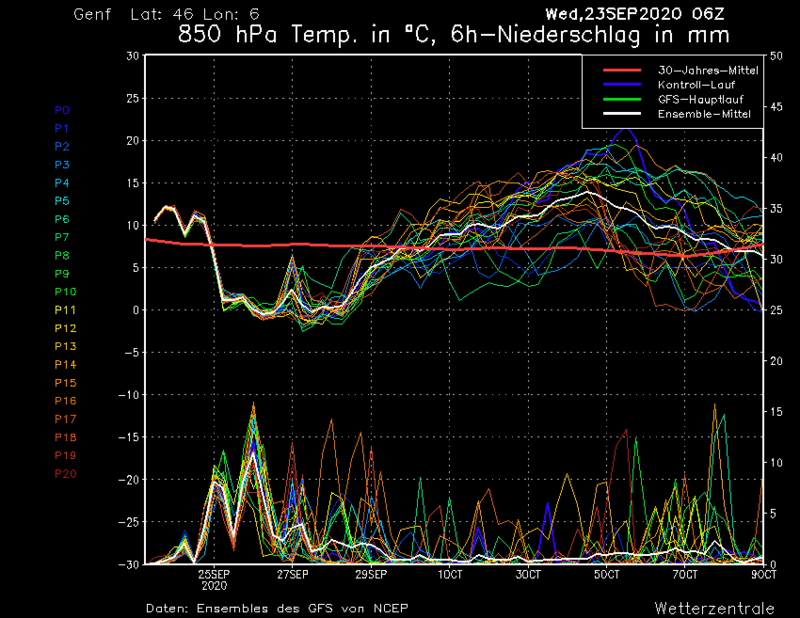 looking ok for next week on the models, no silly temps, and maybe a chance of some fresh snow! should I (and the EOSB folk) get excited about that huge spike on the 22nd, or is it just noise seeing as it's only one colour, and the other "runs" don't agree? gregh, no cause for excitement. If other members start to pick it up on the next run then you can start to take an interest. doh, cheers Brian! How many do you need to get agreeing for it to be more likely? bumping this up, can a nice moderator make this a sticky please??? Meteo It is one of my big interests. My english isn't good enough to explain this. -Tenemos dos líneas en los meteogramas; la superior és la línea de temperaturas a 850 Hpa. Como podéis ver hay muchas líneas; cada una de ellas nos indica una de las posibilidades del mismo modelo (en este caso el GFS). Cuanto más juntas están las líneas mayor certeza tiene la predicción. La línea gruesa de color rojo es la media de los últimos 30 años. La línea gris es la media de todas las salidas (la que se ve en los maps del modelo ENS. -Las líneas de abajo es la precipitación. Sigue la misma dinámica que las temperaturas. La precipitación total en un lugar seria el area que delimita cada línea. Decir que cuanto más lejos en el tiempo, mas improbable es que se cumpla la predicción. Estos lineas se llaman isohipsas. Nos dan la altura del nivel de los 850 Hpa. Es decir en el caso de que ponga 140; quiere decir que la temperatura que marca el mapa se encuentra a 1400m (hay que añadir 1 zero al número que marca el mapa). Mediante esta información se puede calcular la cota de nieve partiendo que cada 100m se baja 0,6ºC; y que la nieve aparece a partir de 2-3ºC. -También hay que tener en cuenta el nivel de 500Hpa, si hay una bolsa de aire frío a 500Hpa de por ejemplo -30 la cota de nieve será de 500m aunque a 850 Hpa haya 0ºC. Debido a que en el momento de precipitar el aire frío en altura se desploma hacia abajo rompiendo la estratificación de las capas de aire. Así pues puede empezar a nevar con temepraturas de +8 o +9ºC (yo lo he visto en mi ciudad el año pasado); y luego bajar la temperatura en picado (en 5 minutos) hasta los 0ºC. Can someone proficient at Spanish and English try and translate metalhead132's effort ? 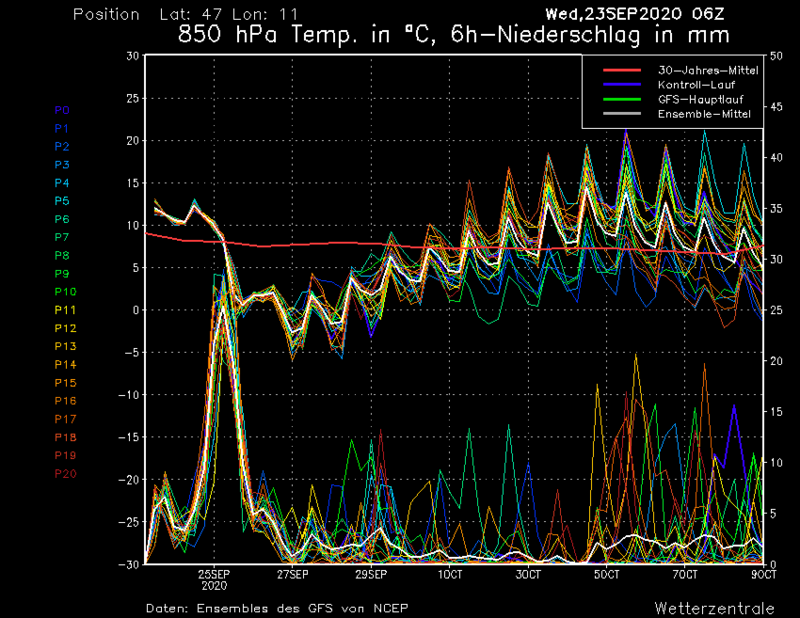 - We have two sets of lines in these forecast graphs, the top set is represents temperatures at 850 Hpa. 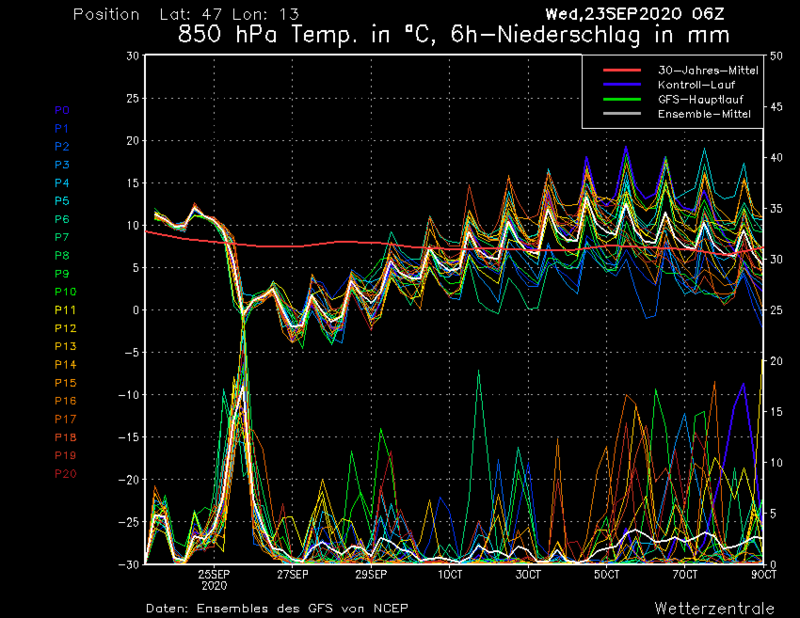 As you can see there are quite a few lines, each one tells us one possibility of the model (in this case GFS). The closer together they are, the more certain the prediction. The thick red line is the 30-year average. 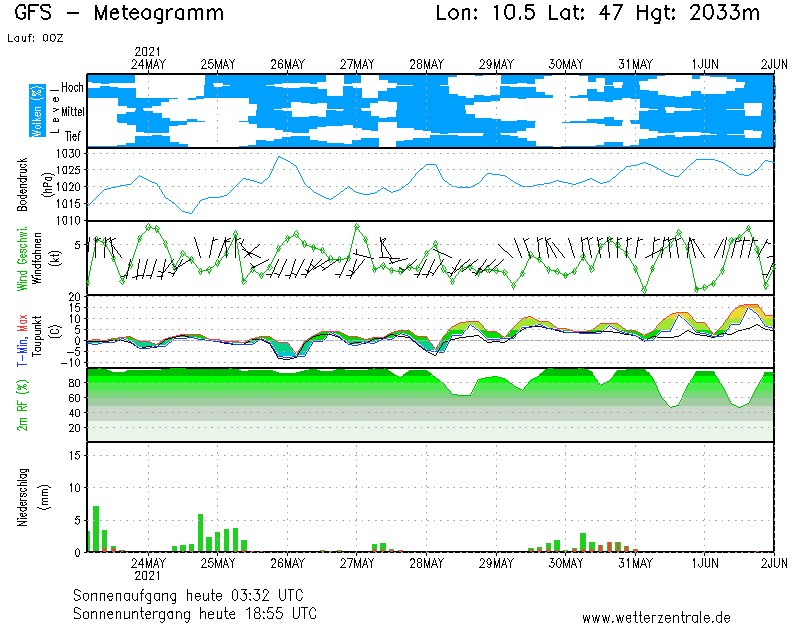 - The lower set of lines represents precipitation, following the same arrangement as the temperatures. The total precipitation at a given location is proportional to the area bounded by each line. One can say that, the further off in time, the less probable a prediction is. The lines are called isohips. They give us the altitude of the 850mb pressure level. In the case of the marked 140, the temperature shown on the map is at 1400m (one adds a zero to the map number). 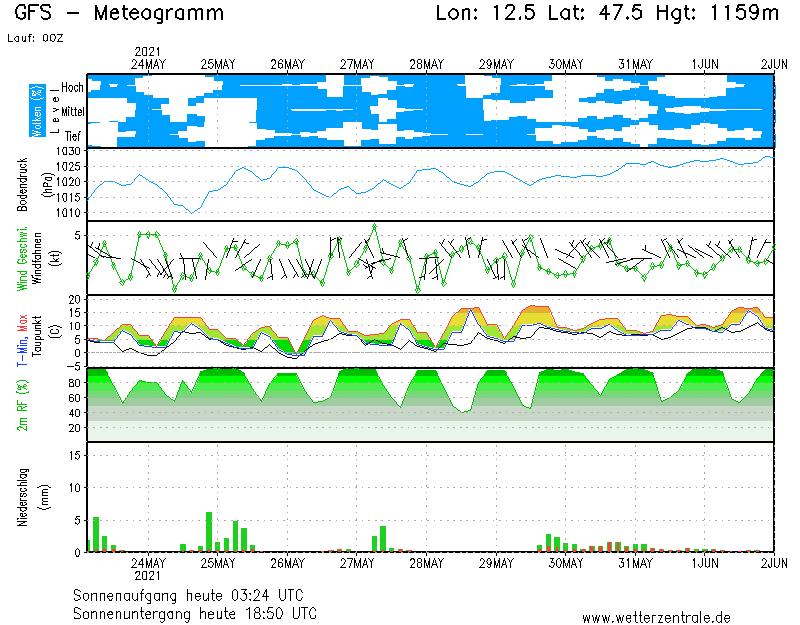 From this information one can calculate snowfall knowing that each 100m gain is a 0,6ºC temperature drop and that snow begins to appear at 2-3ºC. - One has to keep in mind the 500mb pressure level, if there is a cold air pocket at 500mb of -30, say, snowfall might start at 500m although it is only 0ºC at 850mb. This is due to the fact that, at the onset of precipitation, cold air aloft descends and breaks the statification of the air layers. Thus it is possible for it to start snowing at +8 o +9ºC on the ground (I have seen this in my city in the past year); and then the temperature drops fast (in 5 minutes) towards 0ºC. I hope that I have understood it. Heres and cut n paste of some info Brian and Carled posted on another thread..
so http://85.214.49.20/wz/pics/MS_745_ens.png , is lat 45.00 degrees, long 7.00 degrees, which turns out to just to the NE of Sestriere. I've mapped a few other locations. A good site is USAFE (the US Air Force site). Although it is only every 24 hours (from 48 hours out) it gives precipitation rates - and whether it is solid/liquid. You can get a fair idea whether its going to be heavy/light/rain/snow, though of course mountain forecasting is never precise. My personal anecdotal experience is that it is as reliable, if not more reliable, as the Met Office for UK and Alpine forecasts. It does seem to suggest a dump at high altitudes at least at New Year, and I'd expect the snowline to fall to below 1500m as the cold front goes through. do we know how accurate each of the individual predictions in the ensemble has been to date? Would be interestuing to see given the variety of thoughts each one seems to have...? Chris Brookes, AFAICS no prolonged spell of it in sight,...but that could change quite quickly. 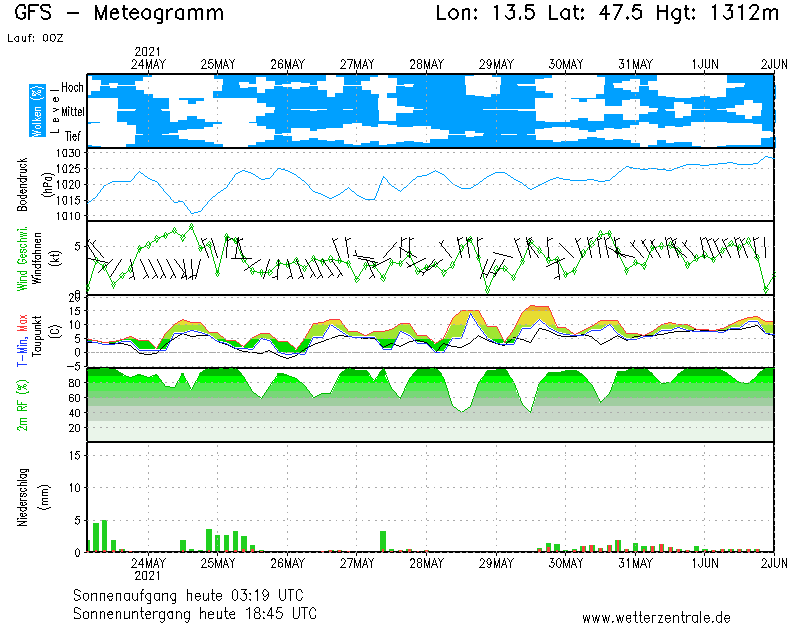 One thing to mention is that snow will generally experience the wet bulb or dewpoint (taupunkt) temperature, not the dry bulb temperature as it is effectively a wet surface. This *may* help reduce melting (depending on values, obviously) unless in strong, direct sunlight. ... to put yourself on the same side of the Bernese Oberland as Engelberg.